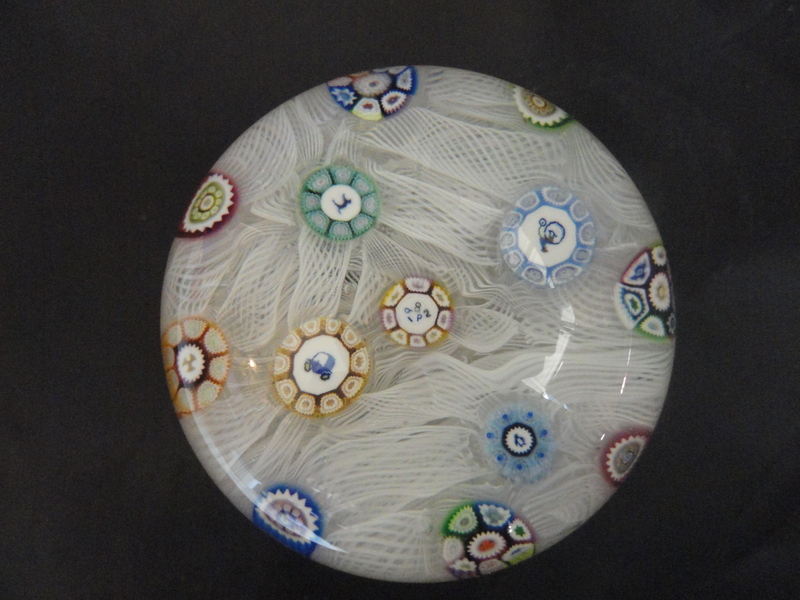 Another major grouping of paperweights is the use of millefiori canes in the construction. 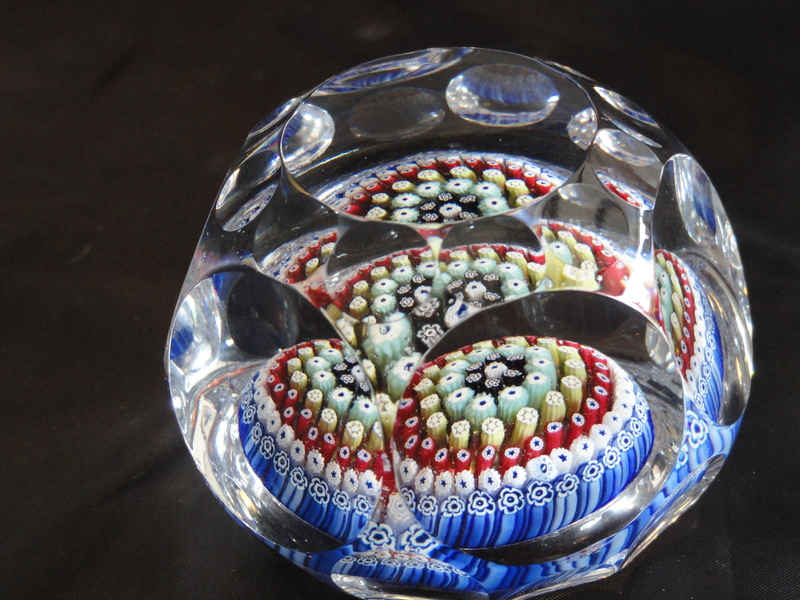 Millefiori-decorated objects have been created intermittently from the time of ancient Mesopotamia to the present day. Bowls of fused millefiori canes are known to have been made in ancient Rome and Alexandria, and there are a few references to examples of millefiori work during the Renaissance. 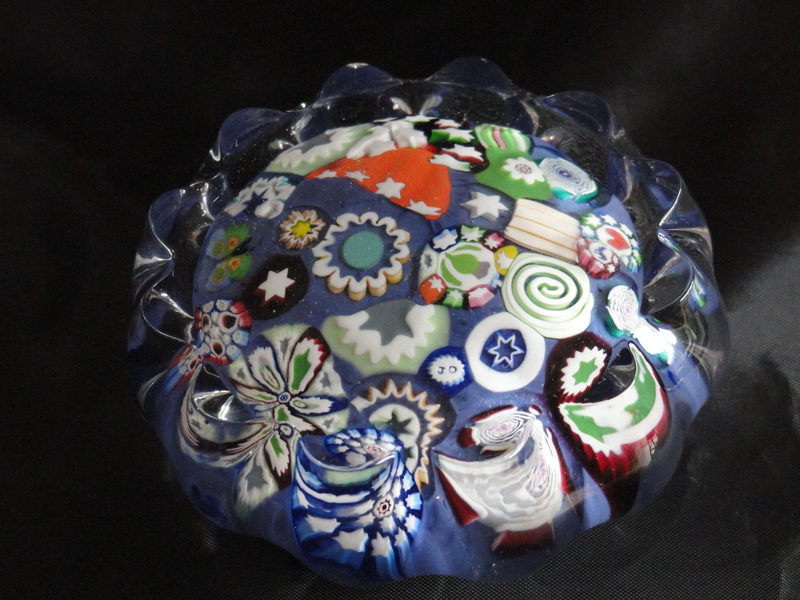 By the eighteenth century, however, the technical knowledge for the manufacture of millefiori was lost. It was not until the nineteenth century that a revival of the technique appeared. 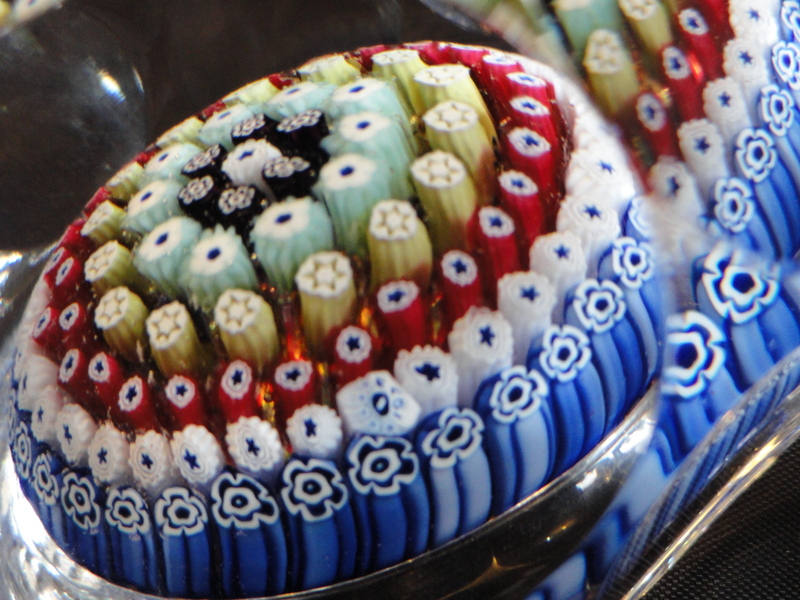 By the end of the 1830s, millefiori were manufactured successfully in Silesia-Bohemia. Within two or three years of its rediscovery, factories in Venice, England, and France were also producing quantities of millefiori canes. 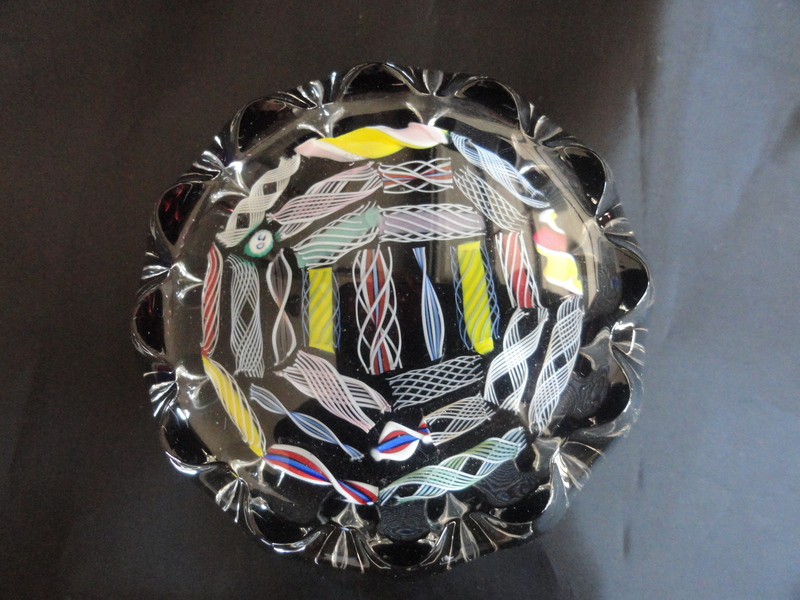 Cut from long, thin glass rods, millefiori canes were prepared in the following manner: The glassworker took a gather of molten glass on a pontil, or long iron rod, and rolled it back and forth on a marver, or flat surface, until it formed a solid cylinder. The cylinder was then pressed into a die-cut mold that had a geometric shape or the outline of a specific animal or figure. 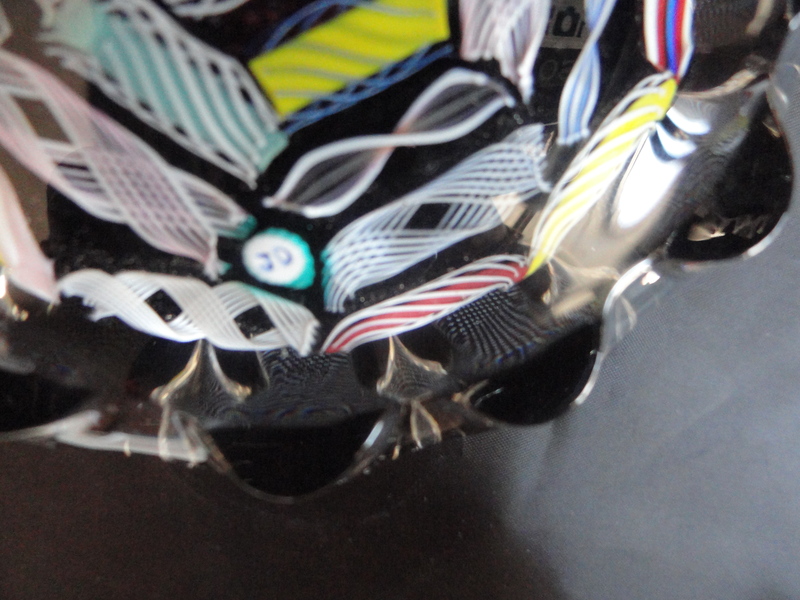 The piece was further embellished by dipping on additional layers of varying colors of glass. As each layer was added, it was rolled onto the ever-growing cylinder or pressed into increasingly larger molds to vary the cane’s ultimate design. 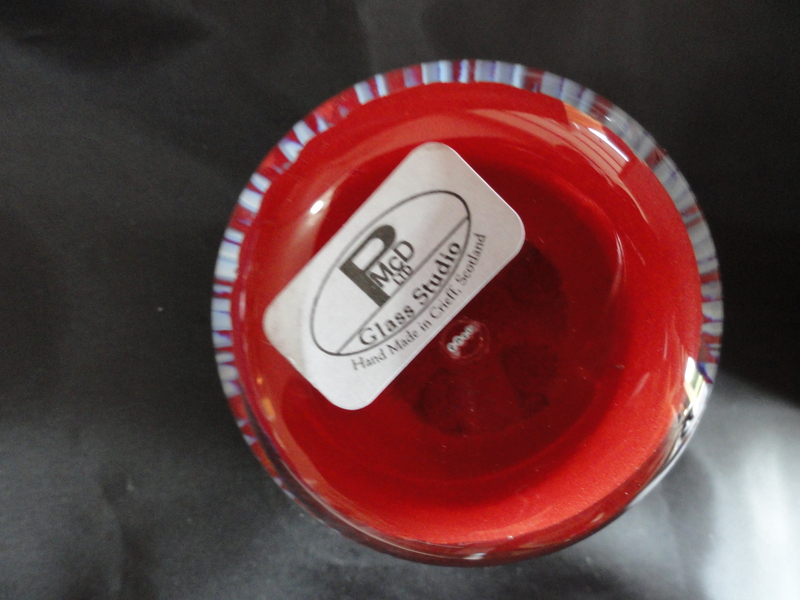 The finished cylinder of glass, approximately six inches long and three inches in diameter, was reheated until pliant. The pulled apart, stretching the yielding cylinder pencil-thin. The stretched cooled cane was then sliced into hundreds of little discs, each an exact miniaturization of the original design. For more complex designs, lengths of the stretched canes were cut into six-inch pieces, bundled in a geometric pattern, heated until fused together, stretched pencil-thin, and slices again. 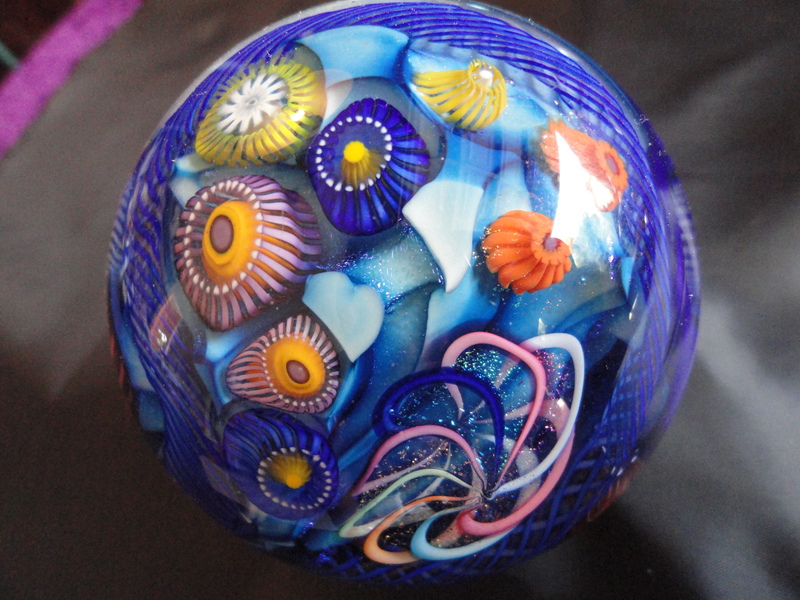 In this manner, glassworkers were able to produce unlimited millefiori cane designs from a limited selection of molds. Once a quantity of millefiori canes was produced, they were combined into a variety of patterns limited only by the ingenuity of the artisan. 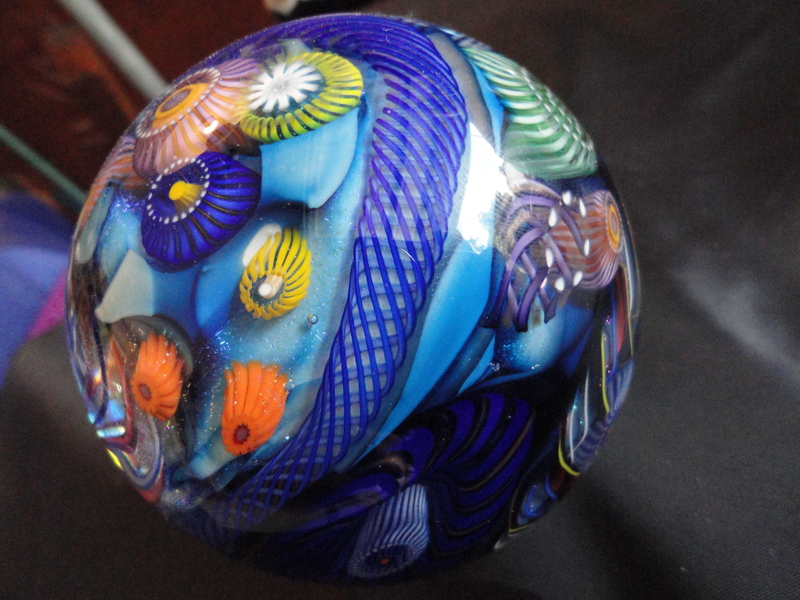 To create a paperweight, a design of canes was arranged in a metal ring, and a gather of molten glass on the end of a pontil rod was brought down upon the design. The canes adhered to the molten glass. 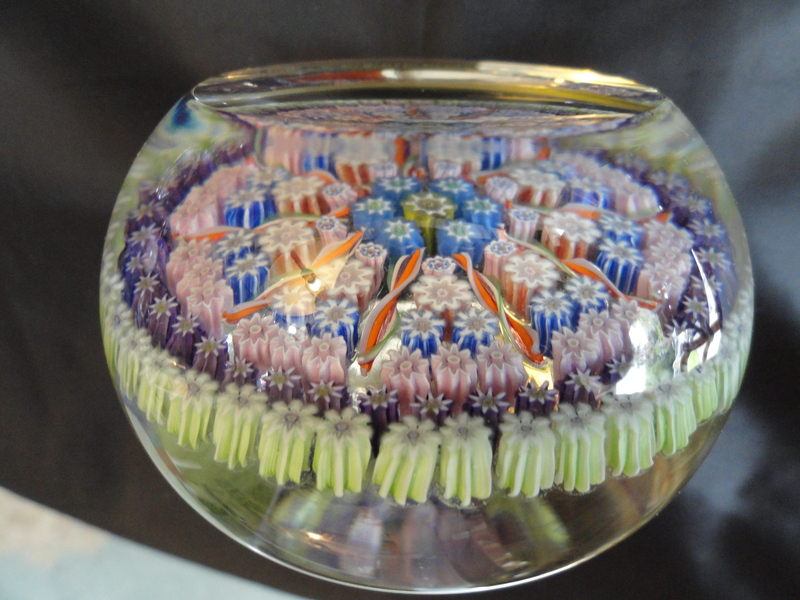 The rod was repeatedly dipped in glass until an adequately thick lens was produced over the millefiori design. 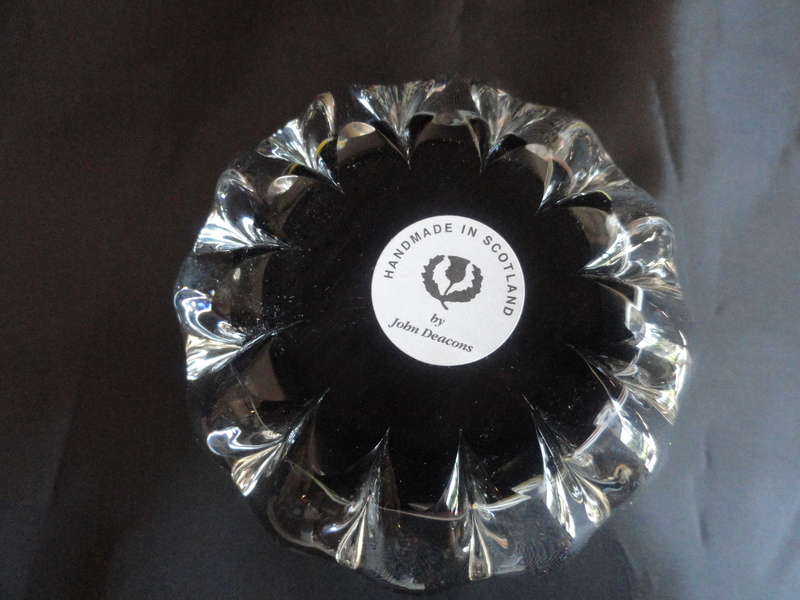 While still plastic, the glass was blocked and shaped. Slightly cooled to a stable state, it was broken off the pontil rod and placed in an annealing oven to cool slowly. There are specific kinds of canes formed by the glassmakers. They include, in addition to the myriad types of flower-like patterns, the simplest rod canes, star canes, cog canes (shaped liked the cogs of a gear wheel), Clichy Rose cane, and sillouette canes, which contain a figure of an animal, person, or plant, a date or maker’s mark. 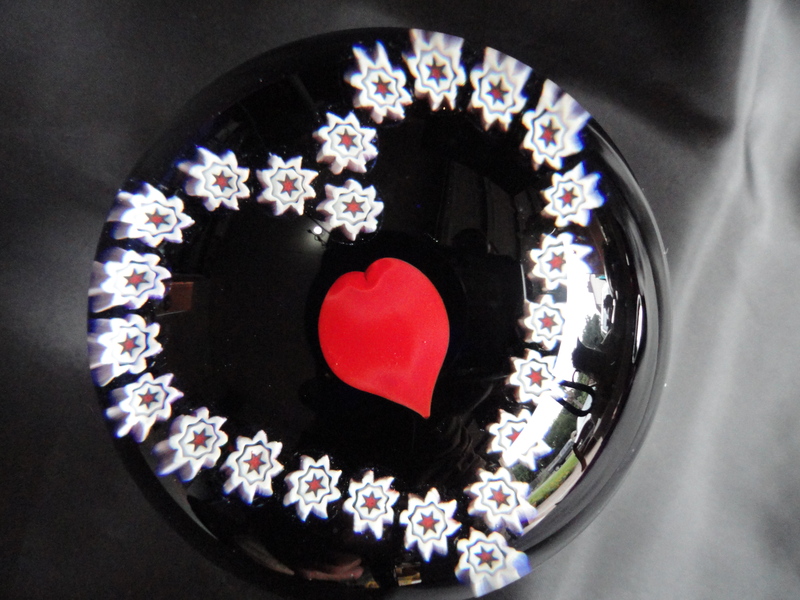 Millefiori weights are categorized into types and named according to the configuration of the canes. 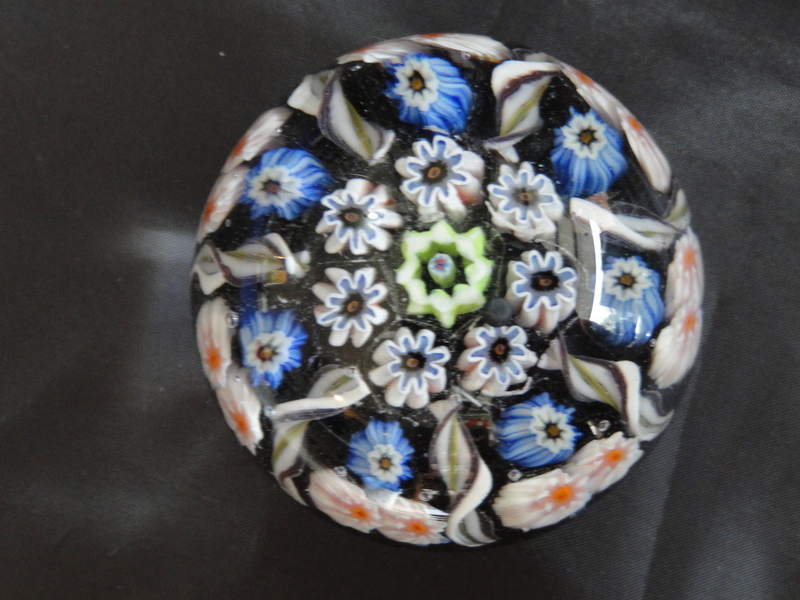 Concentric millefiori weights may be closely positioned or spaced in rings around a center cane. 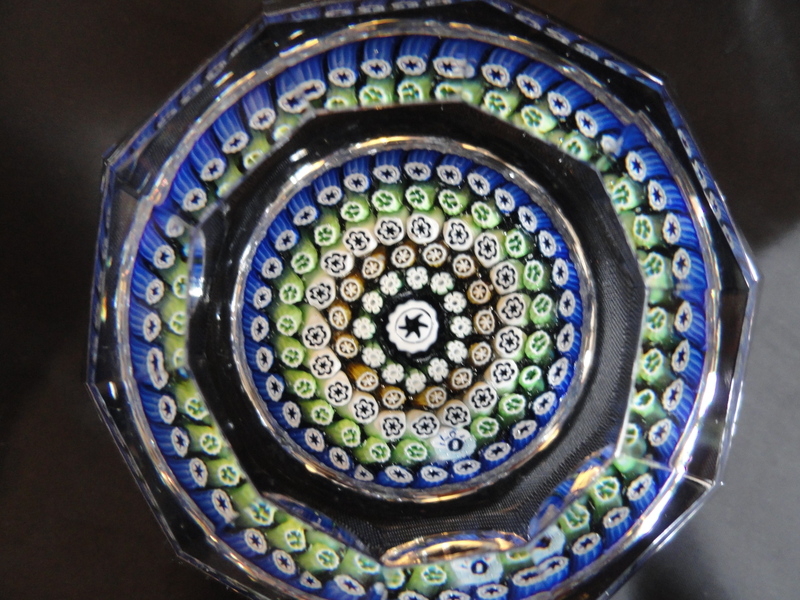 This Perthshire weight has twisted glass rods that divide the millefiori into sections that surround a concentric center. Close Millefiori weights contain a small forest of canes thrusting up from the base side by side with little space between them. 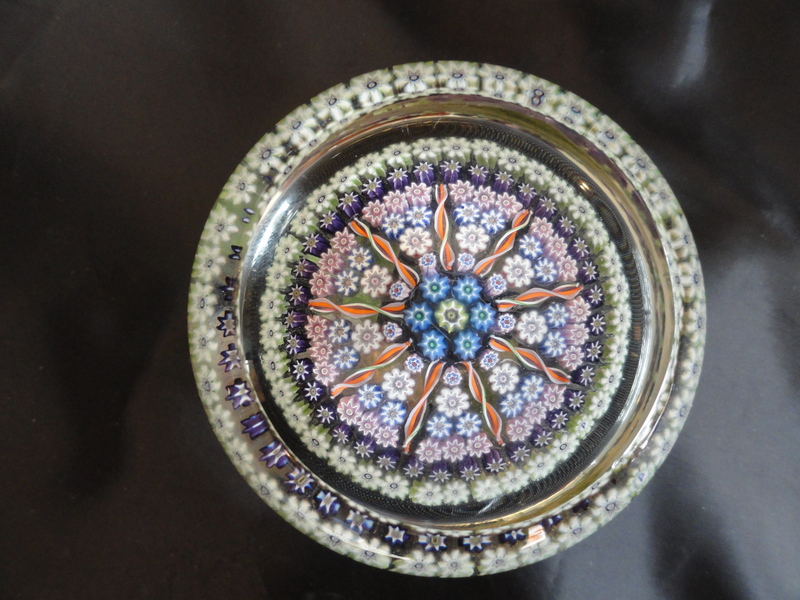 This is a faceted 1978 Whitfriars Millefiori PW. Enlarge the photos to see the signature cane. 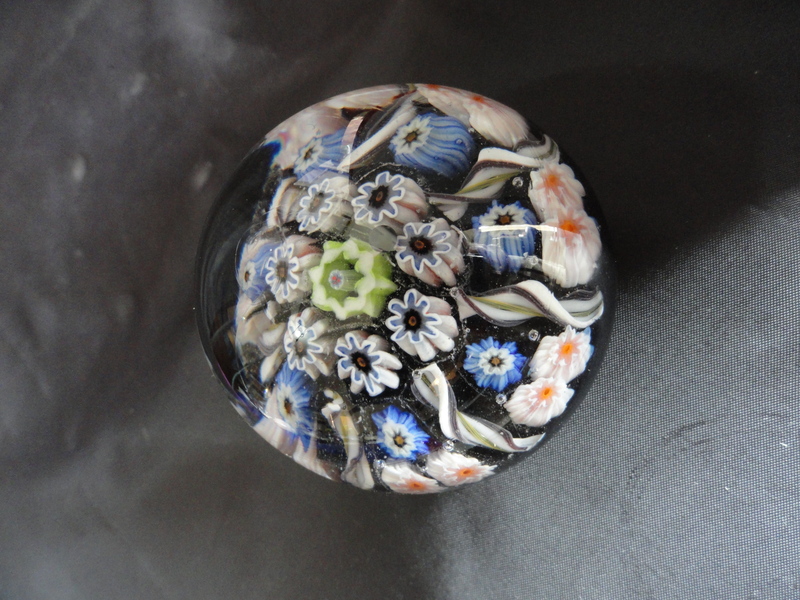 It is always exciting to find a paperweight with a cane that has the signature of the maker and the date. The Whitefriar signature cane is a monk. That is because the Whitefriar factory is an old monastery. 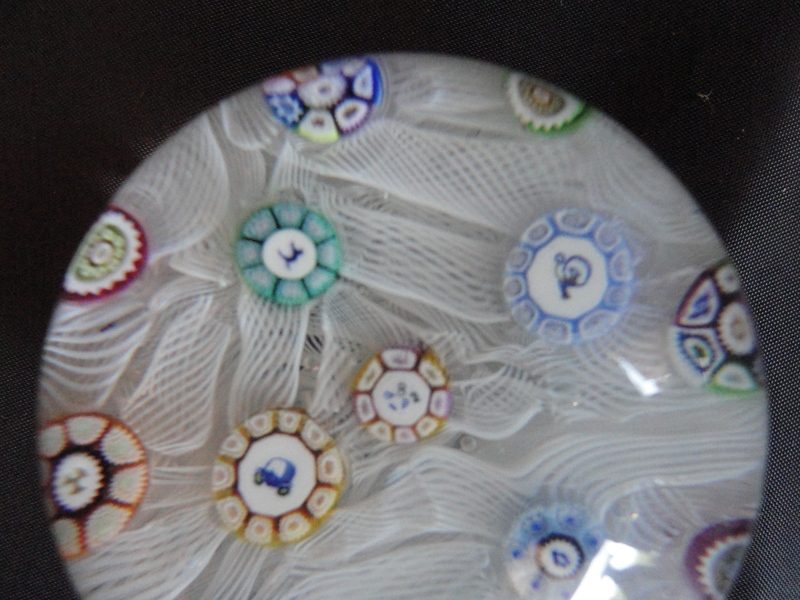 Concentric millefiori weights may be closely positioned or spaced in rings around a center cane. This is a nice example of a bee hive faceted weight by Whitefriar. Pattern millefiori weights feature canes that are arranged in patterns such as lines, flower-like forms, or symmetrical rings. 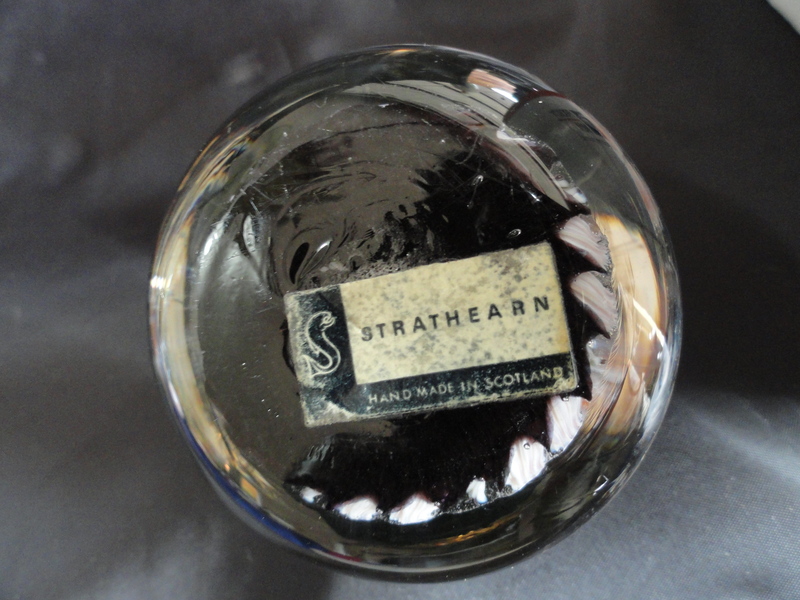 This is a Strathearn from Scotland. It has a “floater” a piece that separated from the glass canes into debris (in this case a tiny black ball) and then floated up into the encasement of the PW. This reduces the value of the weight unless a collector is looking for the non-perfect weights. Pattern Millefiori weights feature canes that are arranged in patterns such as lines, flower-like forms, or symmetrical rings. A colorful PMCD, Peter McDougall PW from Crief Scotland. Signature cane is in the base. Pattern millefiori weights feature canes that are arranged in patterns such as lines, flower-like forms, or symmetrical rings. 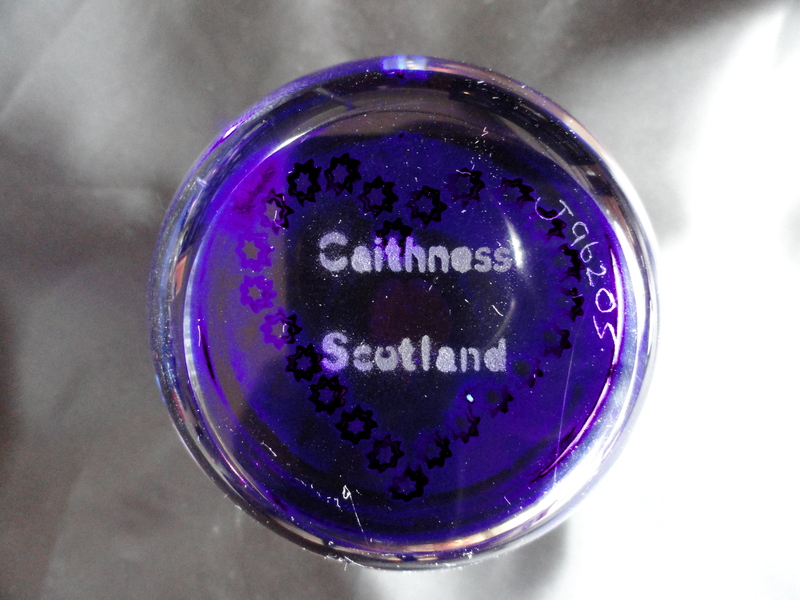 This is a Caithness Scotland PW. Carpet Ground Millefiori weights look like a carpet of small identical ( often star or rod) canes interspersed with larger spaced millefiori canes. 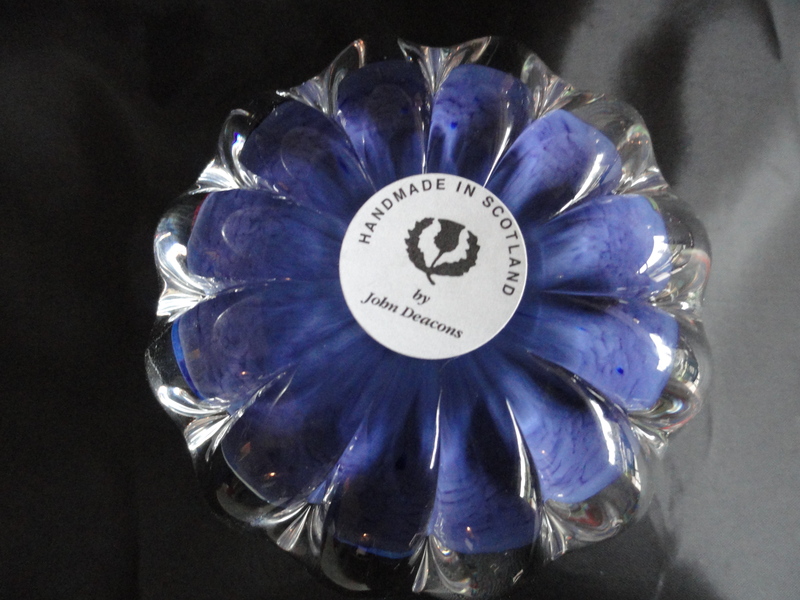 Not a great example but a nice John Deacons ribbon paperweight. 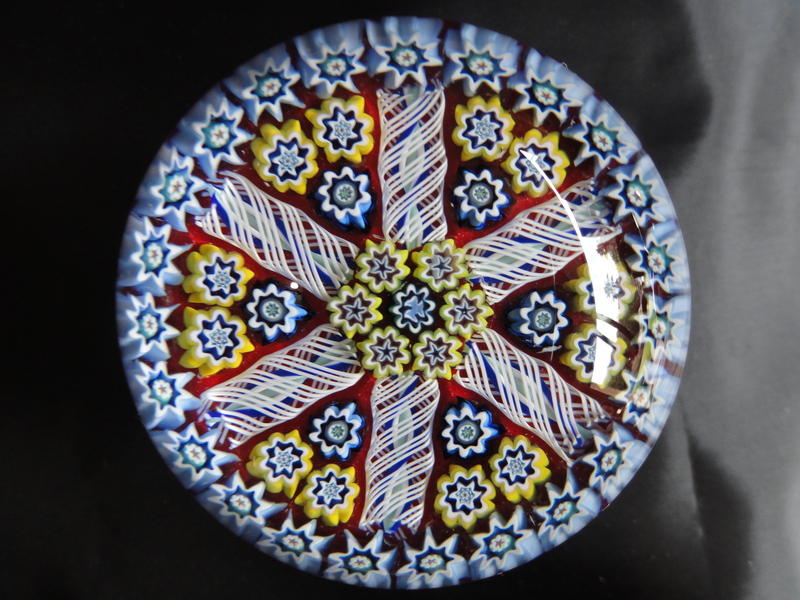 Chequers Millefiori weights get their name from the filigree twists that act as separators among the space canes. 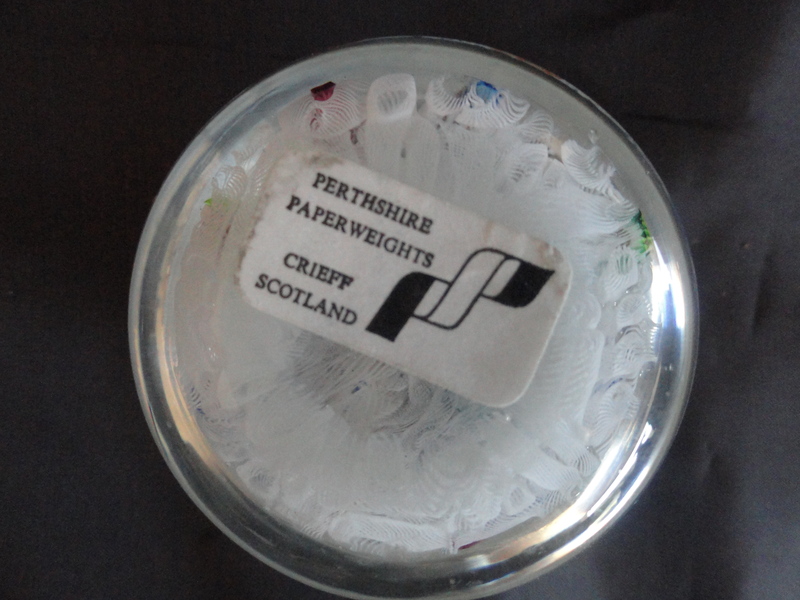 A very nice 1982 Perthshire with signature cane in center. 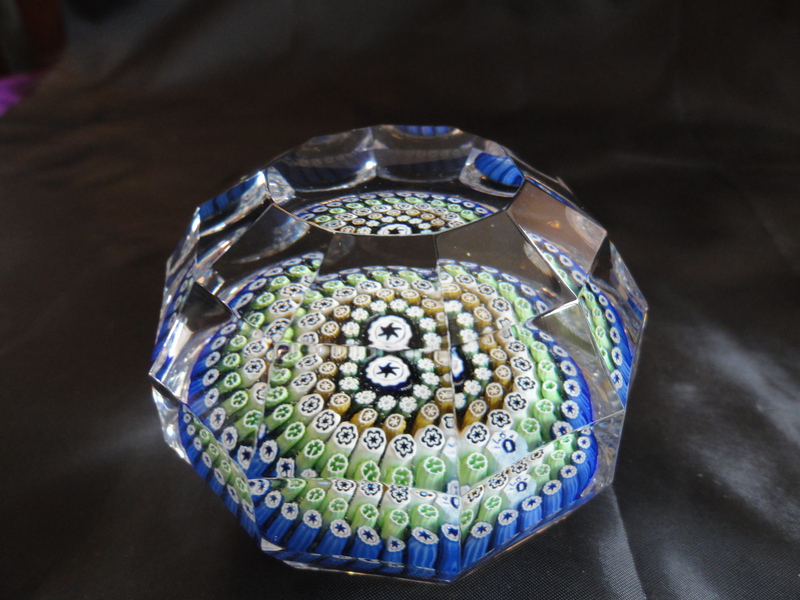 This paperweight also has some nice silhouette canes on a filigree lace bed. WOW! End of day? Not really. This is a scrambled weight where the artist has messed with the canes by heating them, pulling them and added all kinds of glass delights. Made by an artist in Pitsburgh PA by the name of James Alloway. Titled “Psychedelic”. Garland millefiori weights contain canes arranged in loops, lobes, C-scrolls, or circlets. Mushroom millefiori weights are those containing a central upright mushroom-shaped cluster of millefiori canes in a clear body, with or without overlays and printies. Overlays consist of a coating of colored opaque or translucent glass on the surface of a (Usually millefiori) weight, through which are cut windows called printies. Single cane millefiori weights contain just one center patterned canes on a textured background. I currently do not have weights of the above so no photos. As I get PW’s I will add new examples of the millefiori weights. 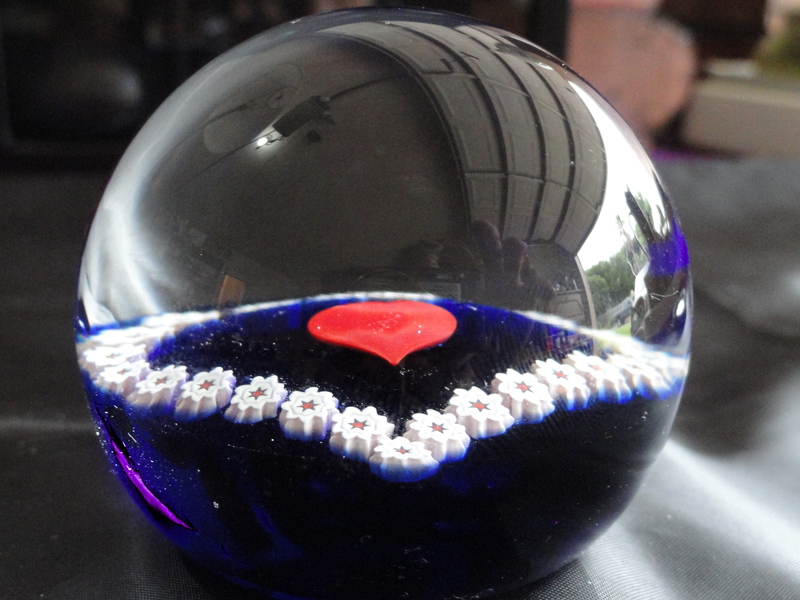 If you would like to see more of the PW’s I do have visit my eBay store “Kelekchens”. You can do that by putting your cursor on my assistant “the duck” and press enter. Thats it for today. Happy collecting and remember “The best is yet to come”!